Want to inspire your students to fulfil their potential? Need to give your children a safe and dry place to play or work? How can canopies improve the educational experience at your school? Stylish school canopies are perfect for providing playground shade, covered external classroom space or an effective walkway canopy between buildings and are an attractive addition to any school. All our structures have been designed solely with the interests of children in mind and offer a range of solutions; from weather protection and shade from the sun to forming an architectural entrance canopy. Theyre available in a range of brightly coloured PVC coated polyester fabrics to make them appealing to children as well as adults, and the fabric can also be printed with images or branded to suit your school. Our range includes entrance canopies, shade structures and drop-off canopies to provide a safe shelter from the elements for children waiting to be picked up from school. 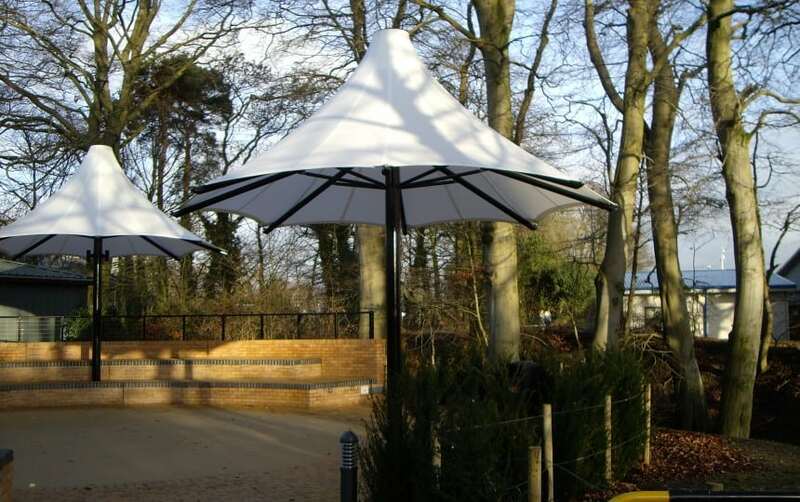 Shade structures can be mesh or solid fabrics to vary the shade levels and some structures can also be fitted with solid or mesh roll-up sidewalls to provide enhanced sun protection. Our range of walkway and shelter canopies can provide protected access and playground shade between buildings and can be shaped to your needs, including being fully enclosed if required. Some of our playground structures are designed to be modular canopies, meaning a number of pieces of a covered play area can be fixed together or removed to fit the purpose and allowing for the shape of the structure to be repeatedly modified. Some schools use our structures to create spaces where children can play and relax in all weathers. Christ the King Catholic School and Ibstock School used different means to achieve the same end a weatherproof, protected space but both with effective results. Tensile fabrics can also allow more complex shapes to be created. Amphitheatre structures can offer an inspirational performance space to take learning outside and encourage students to let their creative juices flow, as seen with the amphitheatre canopy at Archbishop Grimshaw Catholic School, in Birmingham. Most of our designs are permanent structures that can be designed from PVC-coated polyester or the more durable PTFE-coated glass cloth. 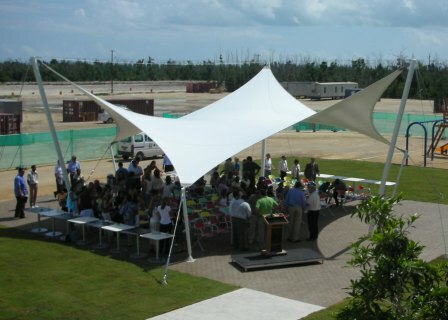 However, not all our structures are permanent as we also offer demountable fabric designs for schools looking for summer or event canopies as can be seen at the Cayman Islands International School. Our structures are available in all shapes, sizes and designsand can be widely adapted to your school’s individual need to give pupils the perfect learning and play spaces. They are quick and easy to install meaning very little disruption to your school day!